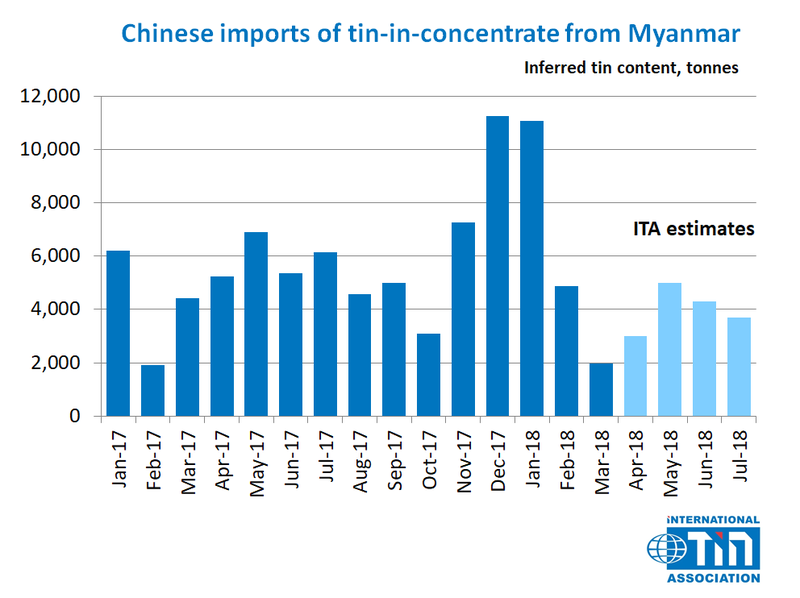 The tin content of Myanmar ore and concentrate shipments to China in June and July was estimated by the International Tin Association (ITA) at 4,300 tonnes and 3,700 tonnes respectively, down 19% and 38% year-on-year. The estimated tin content of Myanmar shipments from January to July totalled 34,000 tonnes, down 5% compared to the same period last year. In the absence of published Chinese trade data from China for months beyond March, ITA has collected data on shipments from traders, smelters and other local experts. Purchasers have reported that the average tin grade of Myanmar ore and concentrate has declined in recent months. Concentrates produced via froth flotation now account for 70-80% of shipments from Myanmar, but are more expensive for smelters in China to process and have driven up costs. Our view: We anticipate that Myanmar mine production and shipments to China will remain at lower levels for the remainder of the year. Our forecast for Myanmar’s mined tin output in 2018 is 54,000 tonnes, down from 67,000 tonnes in 2017. We caution that despite strong qualitative indications of future declines in tin output from the country, past production forecasts, including our own, have consistently underestimated production potential from the Wa region of Myanmar. Forecasting Myanmar production remains subject to significant uncertainty, particularly with the recent absence of Chinese trade data. Regardless, we expect that a continuation of lower shipments of tin from Myanmar will largely be offset by increased mine production inside of China this year.